It seemed like only a matter of time before Brandon Cobb won a major event in his home state. Well, that time is officially up. 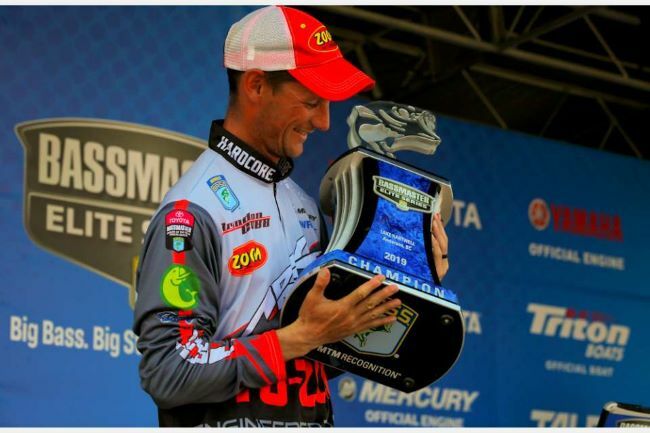 The South Carolina pro put on a clinic with a wacky rig to go wire-to-wire Elite Series win on Lake Hartwell. Throughout the derby, he targeted spawning fish with either a wacky-rigged Zoom Fluke Stick or a Zoom Trick Worm on a Greenfish Tackle Casey Ashley Clean Up Shakey Head. The end result was his first major victory after knocking on the door for years on the FLW Tour. Those years of FLW Tour experience are a big reason he’s no average rookie. In fact, the top five was almost a FLW Tour reunion of former young guns, with Cobb, Stetson Blaylock (second), Micah Frazier (third) and Shane LeHew (fifth) all having spent significant time with FLW in their careers. No surprise, they’re all pretty-highly ranked, too. Cobb may have gotten the victory – which moved him back into the top 20 (in 20th) – but he’s still four places behind Frazier in our two-year Majors Ranking. Blaylock is next in line, now sitting in 48th after his runner-up finish, and LeHew sits in 62nd after only his second top 10 in the last decade at the major level. Looking ahead, this weekend should provide a MASSIVE shakeup, as all three major tours are competing. So look for a lot of shuffling in our next update.